SUTTON COLDFIELD, UK, April 09, 2019. Gearbox manufacturers provide modular product portfolios by offering different numbers of gear teeth, gear stages that allow flexible combinations, and by varying the number of planetary gears. The speeds and loads on gearbox components such as gear teeth, shafts and bearings vary according to the application. Depending on the gearbox configuration and the associated requirements in terms of rigidity and load carrying capacity, bearings with different dimensions must then be implemented in a single bearing position, which requires a wide variety of housings, housing covers, gears and shafts. The objective of Schaeffler’s new concept is to allow bearings of different designs but with identical dimensions to be implemented in one (i.e. the same) bearing position for various gearbox configurations. These “interchangeable gearbox bearing solutions” will be available based on dimension series 18 for high precision servo planetary gearboxes. For example, FAG deep groove ball bearings from series 618, INA angular contact ball bearings from series 718, and INA SGL angular contact roller bearings, allow the bearing support’s load carrying capacity, speed range and rigidity to be adjusted while retaining the same design envelope. Of the three variants, the INA SGL angular contact roller bearings offer the highest level of rigidity, which allows extremely rigid bearings and drives with very high positional accuracy to be achieved. Identical outside dimensions eliminate the need for special adapters and component variations, particularly for the shafts, housings and housing covers. The associated development steps such as drawing modifications and NC programming in the manufacturing process, are no longer required. The reduction of gear, shaft and housing variants means higher production volumes, lower unit costs and faster deliveries. The design envelope and rigidity requirements of planetary gears means they are often supported by cylindrical rolling bearings without an outer ring. 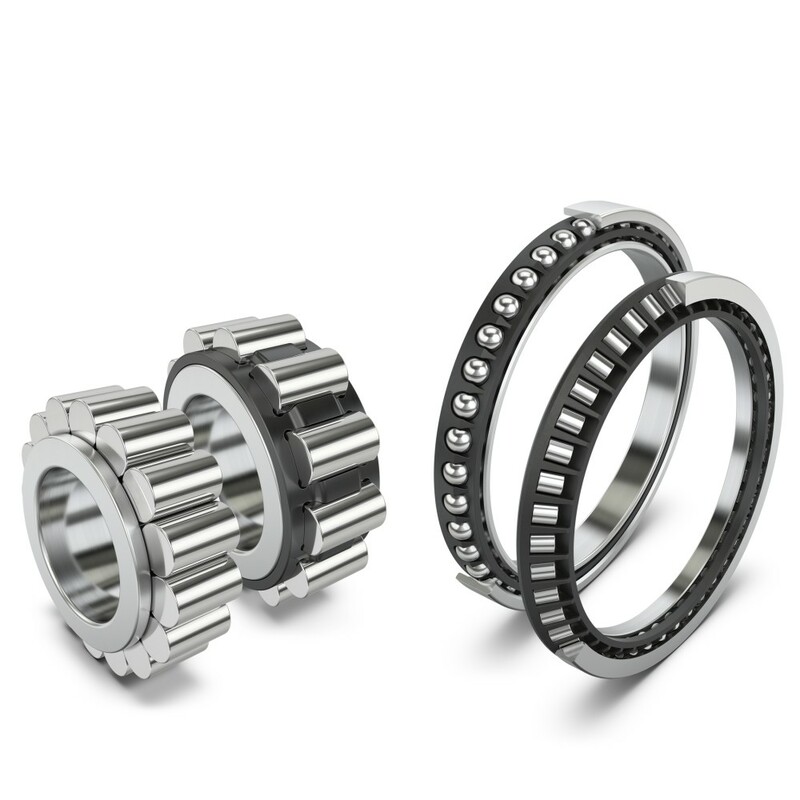 Both full-complement designs and designs with cages are used here, depending on the required load carrying capacity and speed, but these bearings are not interchangeable because their envelope circle diameters are different. As a result, new planetary gears must be designed, produced and mounted. To make interchangeable bearing solutions available, even for planetary gear bearing supports, Schaeffler’s design engineers have developed the INA RSLK1822, RSLK1830, and RSLK1850 cylindrical rolling bearings with cages based on the dimensions of full-complement RSL bearings. These feature identical outside dimensions and so can be used as replacements without any structural changes, design adjustments or additional outlay in terms of time and costs.